Today in Masonic History Lord Randolph Henry Spencer-Churchill is born in 1849. 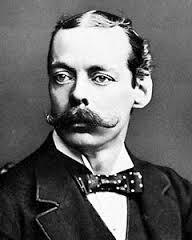 Lord Randolph Henry Spencer-Churchill was a British politician and statesman. Churchill was born in Belgravia, London. After being educated privately he would attend a prep school. He would attend Eton College where some of his classmates would refer to him as a "unruly boy". In 1874, Churchill would marry Jennie Jerome, a New York city socialite. The couple would have two sons. John "Jack" Spencer-Churchill and the World War II Prime Minister Winston Leonard Spencer-Churchill. It is clear that Winston took after his father who was a energetic public speaker himself. When Churchill gave his first speech before Parliament, after being elected in 1874, he received several compliments and at least one member of Parliament and the Prime Minister of the time wrote to the Queen to tell her of Churchill's "energy and natural flow". In 1878 Churchill began his climb as a Conservative leader. He would become a leader of the "Tory Democracy" movement. "Tory Democracy" is a philosophy of governance that assumes society is organic and relies heavily on paternalism and pragmatism. For almost a decade Churchill would be a conservative leader in Britain. It would reach it's pinnacle in 1886 when he would become Leader of the House of Commons and Chancellor of the Exchequer, the British Cabinet position that is responsible for all economic and financial matters. He would resign from the positions in December of that same year. There is some debate about why he resigned. Regardless of the reason, it would effectively end his leadership in the Conservative movement of Britain. In the 1890's Churchill's health would decline. In 1894 he attempted a World-Wide trip to help his ailment, a common occurrence of the time. Unfortunately this had little or no affect on his health and it continued to deteriorate. Churchill quickly returned to England and passed away in London January 24, 1895. Churchill became a member of the craft in 1871 along with his uncle.